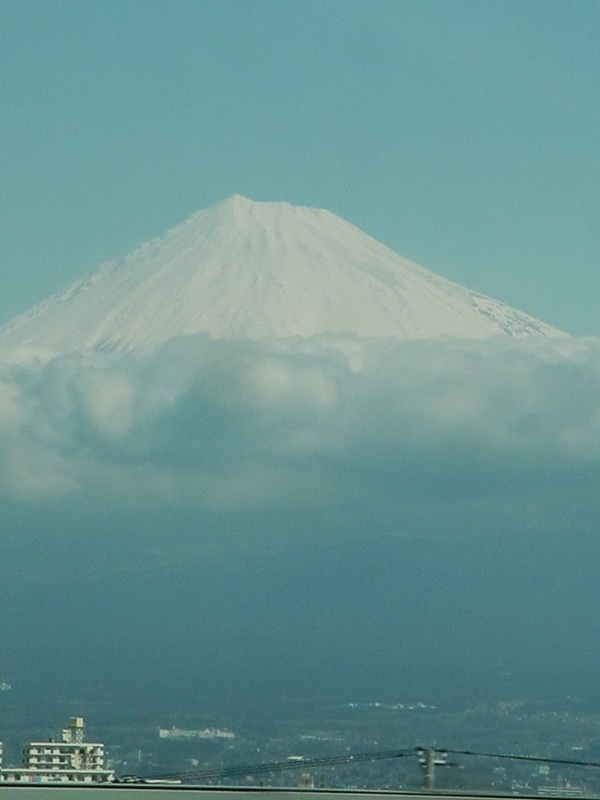 The timing for our Japan trip, being in Osaka in March, was more to do with cherry blossom season than sumo, but as soon as I realised that the annual Osaka sumo tournament coincided with our stay I made sure we would be there. What kid wouldn’t want to see sumo wrestlers in action? I knew for sure that my 8-year-old would! We watched some YouTube videos about sumo before we went so he knew what he was getting himself in for – and he was excited. 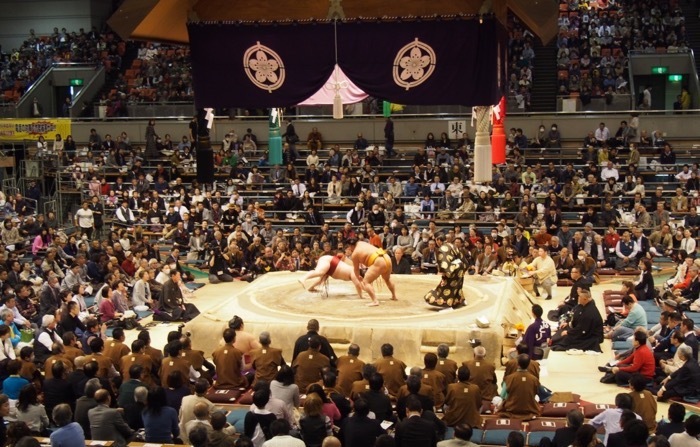 So was I – I’d been to sumo tournaments twice when I lived in Japan and just loved the quirk and culture of them. We ordered tickets online the day they were released – even though the tournament runs for 15 days, tickets go pretty fast now – and there weren’t many of the cheap seats left. (Possibly not many of the expensive ones either, but I didn’t look at them!). 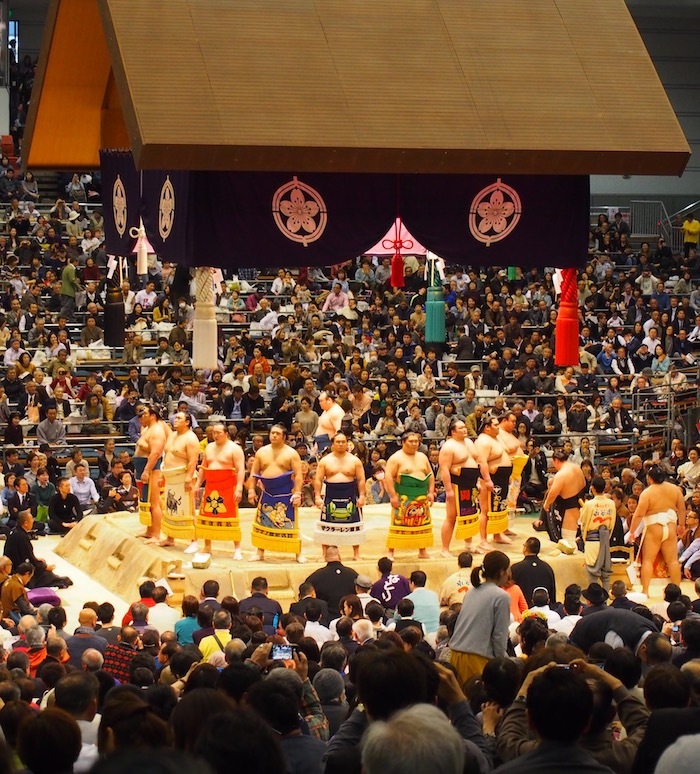 By a completely fabulous fluke I booked our Airbnb apartment right near Edion Arena, Osaka where the sumo tournament took place – which meant that pretty much every day we would spot sumo wrestlers walking around nearby – which was a lot of fun. It’s a very short walk from Namba station so wherever you are staying it will be easy to get to. And you can’t get lost – just follow the big guys! On the day we had tickets for, we headed over around 10am knowing this meant it would be pretty empty and we could leave our assigned seats to sit near the front. This was a trick locals had taught me back in the day and this time round the internet assured me it was alive and well, because most people don’t come until 2pm when the “heavy hitters”, so to speak, start their matches. We didn’t go down into the box area, where you are sitting on the floor, but we could see that others with “cheap seat” tickets like ours did, and it seems that as long as you politely and quickly vacate if the real ticket-holders turn up then it’s all OK.
We arrived at the Edion Arena in Osaka early on a sumo tournament day and had a great view! We stayed for nearly three hours in the morning. This really is a great time to be there with kids, because the morning bouts go much faster. There’s less of the time-consuming ritual in between each bout so there’s a lot of action. Well, sort of – we also had fun using the stopwatch on my phone to time how long the bouts actually lasted amidst all the ritual stuff – some were only two seconds long! 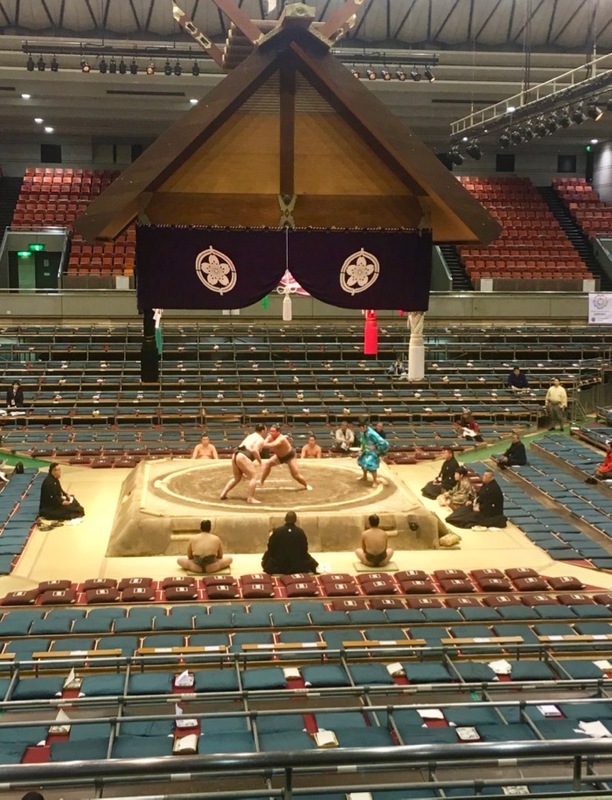 Early in the day at the March Osaka sumo tournament – wrestlers hard at work! We would watch for an hour or so, then go and get a snack, then come back for some more. 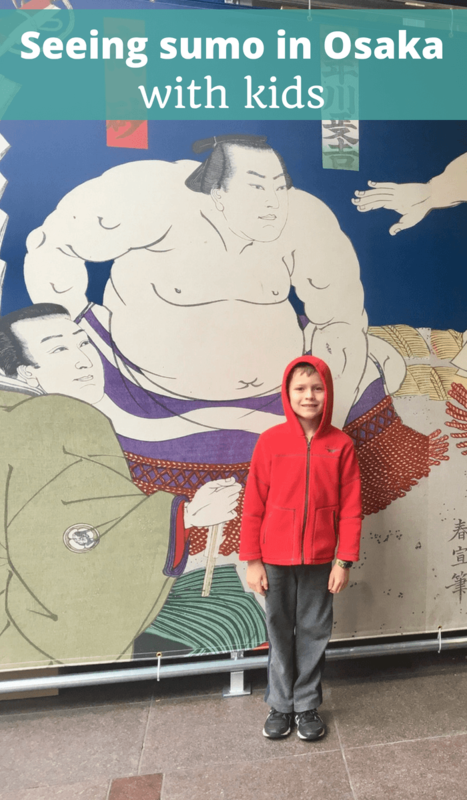 I, once again, was utterly fascinated by the whole sumo ritual, and I was pleased that my son was able to watch for a long time without getting bored. They say you can’t bring food in with you, but it wasn’t checked – nonetheless we got snacks from the shops in the corridors of the arena and from vending machines there too. Some of the tickets you could buy came with pre-paid food packages too, though I’m not sure how kid-friendly they were. You can get one pass out per ticket so we left after a few hours for a break. At around 1pm lots of the big deal sumos were arriving so we stood out the front of Edion Arena to watch them for a while – you get up really close then! It was funny to see them arriving in cars too, some sumo-sized, some not! This is when it was extra handy that our apartment was nearby, so we went home for lunch and came back about 3pm. By then it was like a different place, completely full of spectators and buzzing with atmosphere – but the bouts were much slower! In some ways they were even more interesting as they now included the full rituals like throwing salt but it was a lot longer between action – for example, the sponsor flags needed to parade around between bouts – and not quite as enthralling for kids to watch. We watched this end of the day – where the real champions where having their sumo bouts – for about an hour or so before my son decided he’d seen enough. Without being up-to-date with the current sumo champions, I could understand that (although I eagerly turned on the TV back at our apartment just to keep watching, I must say!). 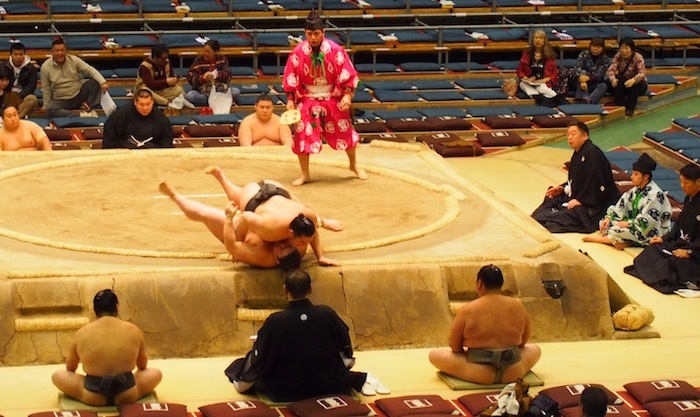 Should you take your kids to the sumo in Osaka? Absolutely yes! It’s not cheap but it’s a once-in-a-lifetime cultural experience of the likes they won’t see elsewhere – one of the most fun things to do in Osaka. 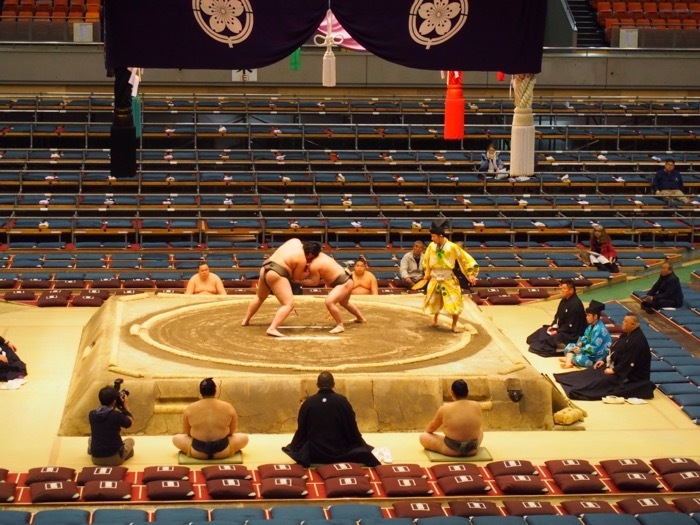 It’s definitely worth learning something about the rituals of sumo wrestling tournaments before you go, and figure out the timing so that you don’t try to get your kids to last the full day there – a day of sumo can be very long. But since the Osaka sumo tournament is held in the second half of March, it’s a great experience to try to combine with cherry blossom season, since they tend to bloom late March/early April in Osaka.